Creative Space, It's Another Vacation! I love having time to do the things I enjoy. I’ve been trying to make time for creativity, but there’s nothing like a vacation. The last couple of days have been especially fun, editing wise. I missed spending quality time with my girls…my female characters, that is. It’s strange. I created them, but they’ve taken on a life of their own. I’m not exactly a girlie sort of person. I look like I would be, but I’m not. I like getting my hands dirty. I like building things. I live in house full of guys, and I’m quite comfortable around them. But there’s a side of me that needs to come out, from time to time. She likes antique china, and ribbons, and frills. She secretly likes the color pink, in small quantities of course. 🙂 She like to watch old, sappy movies that make you want to cry. I don’t spend NEARLY enough time with this part of myself. However, I’ve noticed that the more time I spend with “my girls” on a regular basis, the more I want to do girl stuff. My characters aren’t me, but we share some common interests. I’d hang out with them. So…after a serious round of edits, I decided to give my brain a break. I watched some chick-flicks and drug out my embroidery floss. I don’t know why. My two main characters don’t sew, but I do. I haven’t embroidered ANYTHING in years, but I found some of floss while I was going through some of my old stuff. Wow! 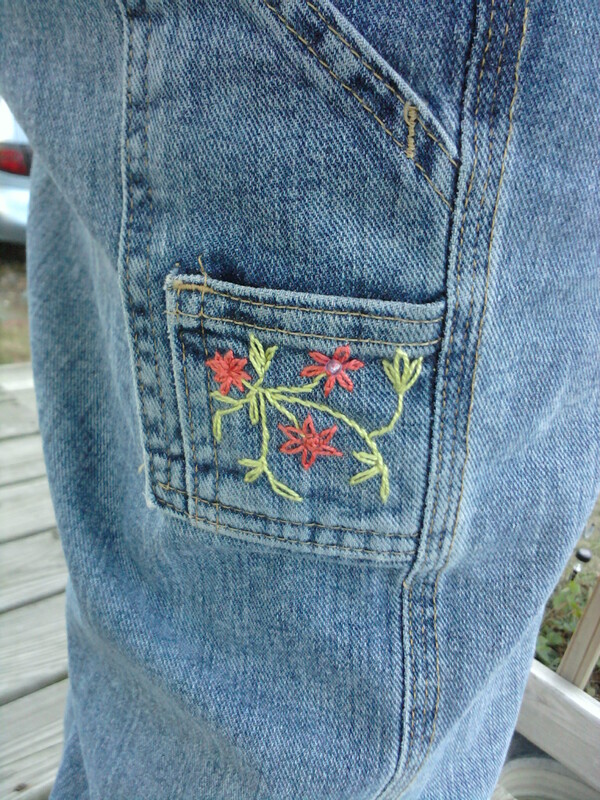 It felt good to be able to be creative with a needle and thread again. No rhyme or reason. No pattern. Just…playing.